Yes, Mark! I want the latest in safe, legal, honest ways to regain control of my personal and financial privacy. I want to take back my rights and I’m ready to take action to do so. The Lifeboat Strategy will help you apply all the fully legal asset protection tricks, tips, and strategies I use in my private consulting practice. 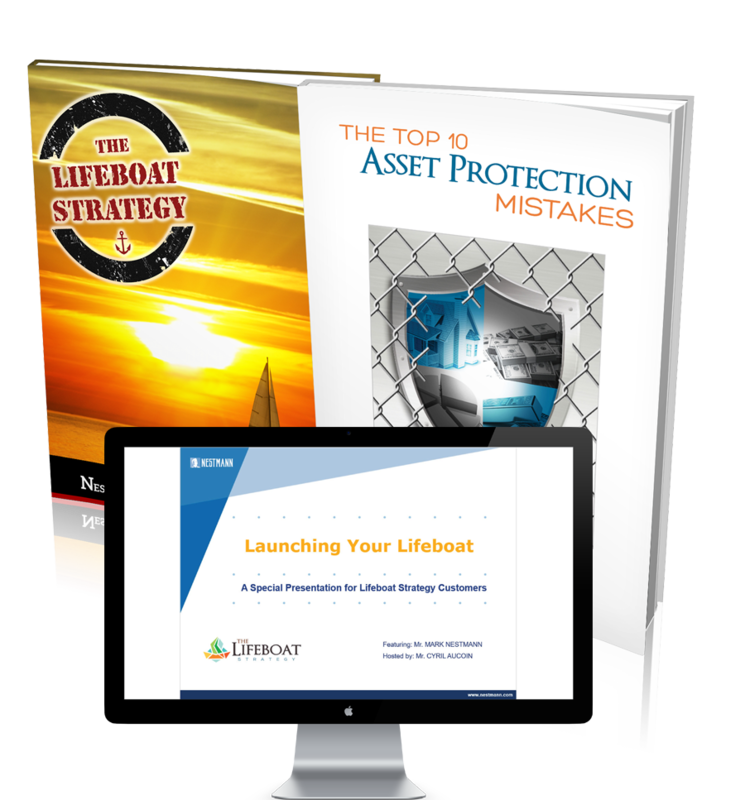 #1: The Lifeboat Strategy Manual: 400+ pages of asset- and wealth-protection strategies learned over 30 years in the business. #2: Accuracy Monitoring Service: Regular supplements to keep your copy of The Lifeboat Strategy constantly up to date. #3: The 11 Best Countries for Wealth Protection: Up-to-date facts, figures, and on-the-ground intelligence from the best asset-protection jurisdictions out there – the same ones I recommend to private clients. #4: How to Stay FATCA-Free: Legal Ways to Avoid Offshore Reporting Requirements. This straightforward report shows how to legally store as little or as much wealth offshore WITHOUT triggering ANY foreign asset reporting requirements. This report cannot be purchased separately and is available only through this offer. Took listeners through 2 case studies from my Private Wealth clients – so you can see real life examples of how my higher-level planning works. You should be able to take some lessons to apply to your own situation. Answered questions from those on the call. Well, we recorded it. You’ll get full access as part of this special package. In the last edition, I spent a lot of time talking about the history driving us to consider stronger asset protection. We completely changed gears and got a lot more practical. Now there’s a much heavier focus on giving you the tools needed to win this game. But, just in case you want the back story, you’ll find it here. Yours free in convenient PDF format. This report covers the most common asset protection mistakes people make. And there’s a very good chance you’re making one or more of these errors, as well. Yours free in convenient PDF format. ensures you receive the latest and greatest version of the product. Actual look of USB stick may vary. There’s absolutely no risk in this investment. If you don’t like it for any reason, you have up to 60 days to request a full refund. PUBLISHER’S NOTE: To be clear – there’s absolutely no risk or obligation on your part. For the next 60 days, you can review the entire Lifeboat Strategy risk-free. This information is the essence of 30 years of experience working in the trenches with clients and customers to protect their assets, wealth, and personal privacy. But if you aren’t happy for any reason in that time, simply get in touch for a full refund. That’s a strong guarantee and the best we can offer. But we stand behind our work. To get started, simply fill out the secure order form below. You’ll start getting access to everything promised in a matter of minutes. Within the United States, shipping and handling is a flat $15. To Canada, the cost is $25. For international clients, S&H is $50 to cover the extra postage. All packages are sent USPS with tracking number. Order Trouble? Call 1-800-320-1908. We're live Monday to Friday from 9am to 4pm Pacific Time. Note: The security code is normally the 3 digits at the end of the number on the signature strip of a card. Some American Express cards have 4 digits.